This weekend, I was feeling weighed down and buried under. And sure, I’ve got things to be stressed and worried about—but I have a lot of really positive things going on in my life too. As I usually do in these situations, I started looking around and asking myself, “Okay, then what’s the problem?” As I looked at my bed, floor, bookshelves, and dresser, I realized my living space was quite literally buried under stuff. This weekend, I’ve been digging out. Part of the problem is that I’ve moved back into my childhood bedroom, a bedroom that stayed pretty much full while I lived in Michigan and collected more stuff. Another part of the problem is my chronic disorganization and inability to put my things back in their place when I’m done with them. I’ve been trying to deal with my stuff since I moved back almost a year ago (!!) but then the files I was filing papers in got left in the middle of the floor, mid-file, and became MORE of the problem instead of the solution they were supposed to be. I actually solved my laundry system a few weeks ago, but failed to implement my system after the next time I did laundry, so once again it didn’t help (although the system did work, once I started using it again). Follow-through is my issue; I can clean and organize just fine, but keeping it that may be a life-long battle. Still, having a harmonious workspace is so important to accomplishing anything creatively. This happened in college too. Gotta write an essay or make an illustration? Clean your room. It feels like the worst kind of procrastination, but it’s also the most necessary preparation. Getting your space in order helps get your brain in order. It lets you think. I’ve made huge improvements to my space in the last few days. I may have put the files in the chest under my bed along with everything else that still needs to be filed. Even if I haven’t finished the filing system, I got it off the floor. The big box of college notebooks and memories that blocked the way to my bookshelf is now also under the bed, and blessedly out of sight. Today, I sorted through cards and correspondence going back to elementary school. I’m trying to create systems for future storage, and I’m trying to make my space more pleasant and functional (how about hanging my earrings on a screen instead of keeping them in crowded boxes on my dresser? And what about framing and hanging those posters?). I’m also working really hard on the follow-through. The most important part of this is that current projects cannot be left out on the floor when I go to bed at night. They must be dealt with and put away. This photo shows a scrap of the recently liberated floorspace, as well as all the BOOKS I can now access unimpeded. You can’t see it in this photo, but there’s another large bookshelf to the right, behind the door. So that’s what’s been going on here. It’s not very exciting, but it’s a big deal for my personal well-being. 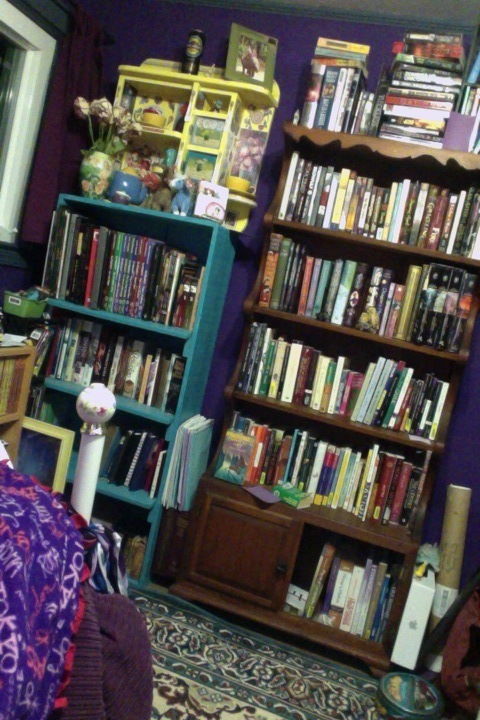 I love being able to reach my bookshelf, and I love actually wanting to spend time in the place I sleep every night. I know I still owe two Race to the 8th prizes. I hope to get them to you very soon! There’s also some other bits of news I should tell you, but this is all for tonight. Cheers!